Hydraulics includes the study and analysis of fluids when in motion and stationary. The part of Hydraulics which deals with the study of static behavior and interaction of fluids is called as Hydrostatics; the part dealing with fluid in motion is called Hydrodynamics. In Civil Engineering Hydraulics we study fluid properties and behavior in different civil engineering applications, such as, flow of water through canals for irrigation, flow through public supply pipelines and water drainage system. In Civil Engineering Hydraulics we also study the effect of static fluid, such as, the pressure and force exerted by water stored in dams on its walls. Hydraulics is not a new science; it has been studied from centuries. Hydraulics went through different eras, more additions and developments to get the shape in which it is studied today. Before starting a technical discussion on Hydraulics in Civil Engineering we will have a sojourn through the history of Hydraulics. The earliest attempt of humans to deal with fluids was probably the construction of canals for irrigation by Egyptians. But they were not interested much in laws or principles governing fluid motion. Greeks were the first to analyze the flow and pressure of fluids. 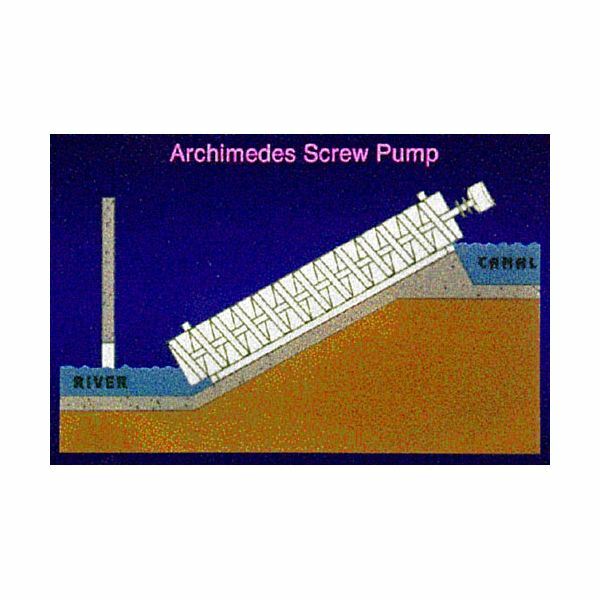 They designed the piston pump, water clock and also the famous screw pump designed by Archimedes. The Romans were also more practically oriented. The concepts which emerged, such as, the continuity of flow and frictional resistance, were mainly the result of observations. The Italians were the first to observe and analytically study the motion of fluids. They analyzed the motion of water jets and found that the trajectory of the jet is similar to that of the projectile, and the efflux velocity of any jet is proportional to the square root of the pressure generating that jet. With the development of mathematics fluid motion analysis became mathematical and the fluid flow velocity and pressure measurements were included in the study. Equipments were developed to measure pressure and velocity of fluids. Now the flow patterns were analyzed more accurately. Fluid flow equations through pipes were developed by Poiseuille. Henry Darcy developed equations for frictional resistance to fluid flow through pipes. Reynolds defined different types of flow and also observed the phenomenon of cavitation in fluid flow. Navier, Stokes and others developed mathematical equations for fluid flow. But there were large disparities between the practical experimental behavior of fluid and that as calculated by these mathematical equations. In 1901 Prandtl proposed that any fluid flow is composed of two parts. One is the free fluid which obeys the hydrodynamics and the other part which flows in close proximity to the fixed boundaries. The fluid flowing near the boundary forms a thin transition layer in which the fluid motion is dominated by the frictional forces. This development led to the unification of the analytical and experimental results. Now fluids are studied under one science, Fluid Mechanics.